Brian Ward is an indigenous rights and climate justice activist based in Madison, Wisconsin. He has spent time working and living with the Oglala Lakota on the Pine Ridge Indian Reservation in South Dakota. 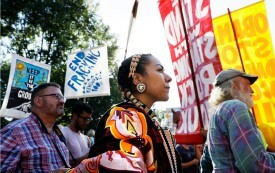 The broken treaties of the past have now become a fundamental piece of the climate-justice battle. Bronson Koenig is using his newfound national platform to speak out against mistreatment of Native Americans.